This script is useful when you only want to display the form when the user visits your website the first time on a specific browser session. If he/she refreshes the page, then the form won't load anymore. Please note that the cookie will be destroyed once the browser is closed. Here's a sample test web page I made. Try visiting it, you'll see that the form will pop-up on a lightbox. Now try refreshing it, you'll see that the form will not load anymore and will show an alert message "Welcome back!". 2. Navigate to the "Embed" tab. 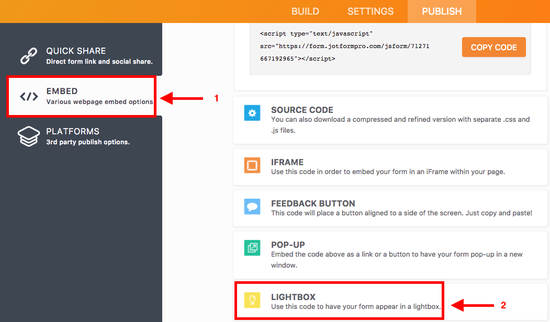 Choose "LightBox" in the list. 3. 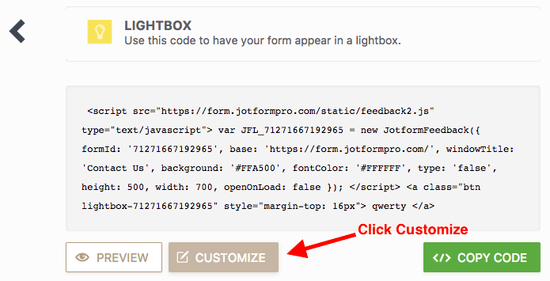 Click the "Customize" button. 4. 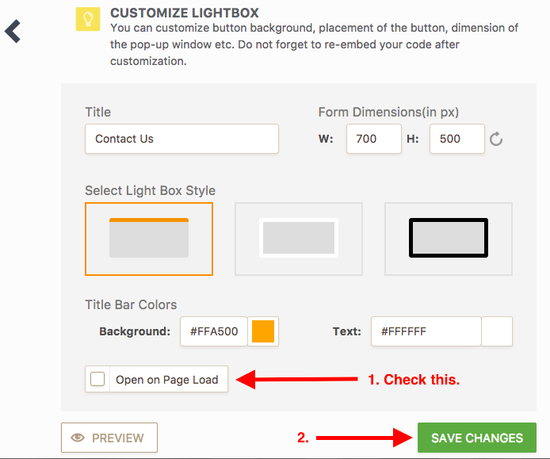 Now make sure to check or enable the "Open On Page Load" option. Click "Save Changes". 5. 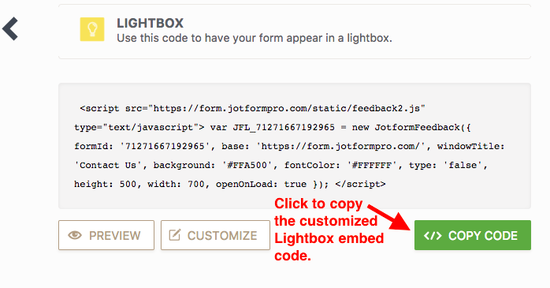 Click the "Copy Code" button to copy your Lightbox embed code. 6. Paste it into your HTML page. In my case, I created a simple HTML page and pasted it inside the tags. The custom script has 3 functions. setCookie() => this sets a cookie on your users' browser when they visit your website page where the form is. It will create a cookie with the string value "username=visited". getCookie() => This fetches the current cookie that was set. checkCookie() => This checks the fetched cookie, if it says that there's a cookie that says "visited", then don't load the form then set a cookie for this user. 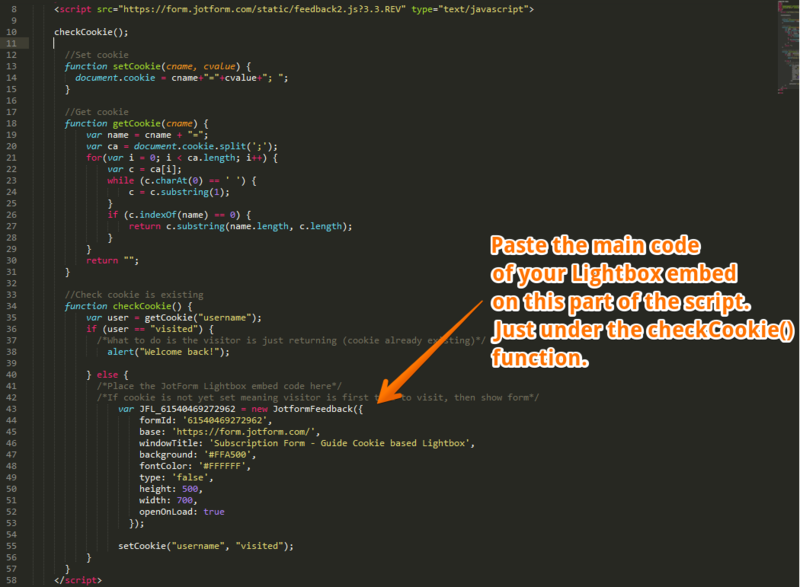 The code above is my Lightbox embed, I just pasted it inside one of the functions which is checkCookie(). So basically the final script will look like the screenshot below. It's still the same script but we just inserted a bunch of new functions for the cookie checker and added the main Lightbox code inside one of the functions. You can edit the script, you can see the comments on each section of my code block, those will guide you. Congratulations! 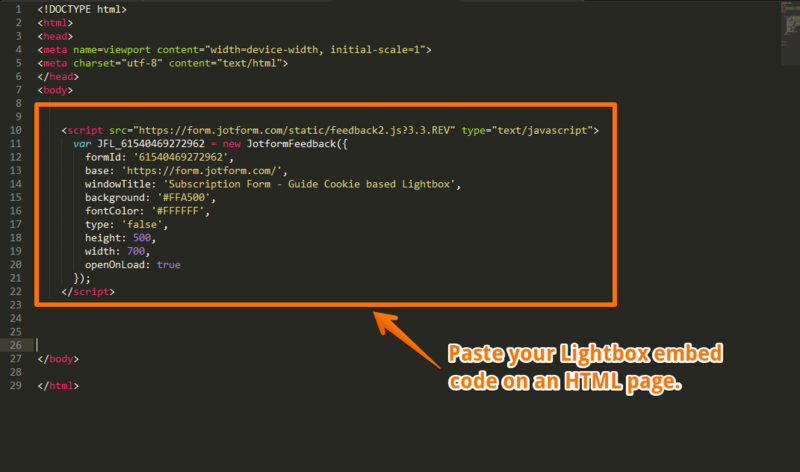 You now have a cookie based Lightbox embedded form. If you needed help on this, please do open a new thread in our forum or feel free to comment below. 1. How do you make the lightbox disappear for, let's say 3-7 days, and then reappear. 2. How do you make it disappear permanently when the visitor inputs his (preferably accurate) data, but not if he just leaves? Hello, I already enabled the responsive function here in the control panel, but my lightbox is not responsive, do I need to insert some script to adjust? Please, I need a solution.